Keep gear secure, organized and ready for transport with the Mini Pocket Organizer from Maxpedition. The compact organizer employs a strategic pocket layout to offer maximum storage capacity within a small footprint. 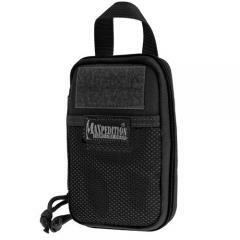 Measuring less than an inch thick, the carrier easily fits in pants cargo pockets or backpacks. The full clamshell-style design lays flat when opened, providing uninhibited access to all contents. Each wall of the organizer features a full-length slip pocket for storage of larger items, as well as a series of elastic retention straps for securing pens, knives, flashlights, screwdrivers, glasses or other small to medium-sized items. The MOLLE-compatible backing offers additional attachment points for other gear and equipment.